The city team were beaten 48-42 by Belle Vue in an SGB Premiership Supporters’ Cup clash at the East of England Arena last night (April 1). 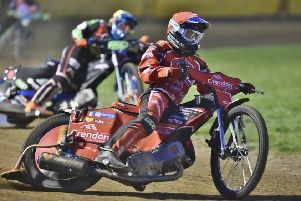 Maximums from top duo Kenneth Bjerre and Max Fricke helped the highly-touted visitors to glory against a Panthers side weakened by the eve-of-the-season exit of former British champion Craig Cook last week. “It was definitely a disappointing result,” admitted Panthers team boss Carl Johnson. “But I think we can call the night a success overall with a really good crowd treated to some cracking racing on a superb track. “We didn’t quite manage to make enough good starts and that cost us against a team with riders of the calibre of Max and Kenneth in their team. “We have a little bit to work on, but that’s only to be expected at this stage of the season with a new team and a new promotion in a new league. Everything has to gel. Only top-scorer Charles Wright, number one Rohan Tungate and short-term signing Aaron Summers managed race-wins for Panthers last night. But Johnson is confident his side can perform well in the return clash in Manchester this Thursday (April 4) while revealing the club continue to explore for a possible new recruit to replace Cook. He added: “Certain riders can hold their heads up knowing they’ve done well while a couple of others will know they need to do better. “We’re a team that relies on every rider contributing and we’re going to be vulnerable if that doesn’t happen. “We have the points to play with and that means all of the boys are riding for their places in effect. “As soon as the right option comes up we can make a move and the person not performing will be the one to go.